Your guest list has been finalized, the location is nailed down, and the date is getting closer; it’s time to really get into the party planning. But if you want your party to be Pinterest inspiration-worthy, then you need a theme! Something girly, something fun, something magical. Fantasy? Too Broad. Mermaids? So last year! Unicorns though… now that sounds just right. Unicorns are growing ever more popular and this year, it’s all about the unicorn party! Colourful, girly, and entirely up to your imagination, not even the sky is the limit when you’re coming up with décor and treat ideas for your birthday party or baby shower. We all know that feeling when you’re out shopping, standing in front of an endless wall of options, or at a restaurant and the menu is 6 over-sized pages in 8 point font. All that freedom can make things a little daunting. So let us narrow it down for you; here are our 10 favourite unicorn party ideas to add a dash of sparkle and rainbows to your event! 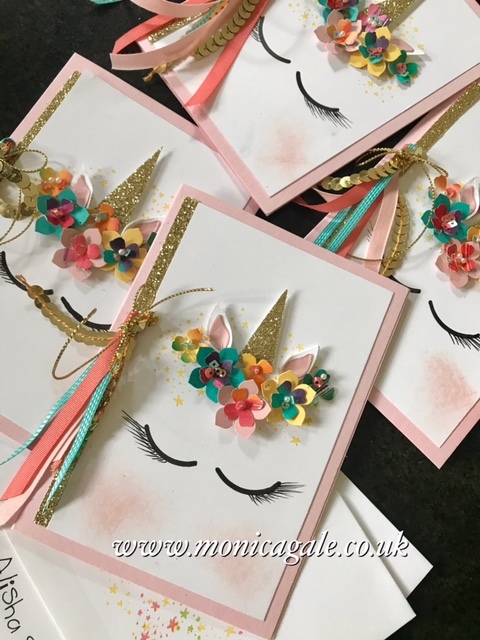 1) Party Invites – With several different routes for the perfect unicorn invitation, there’s an option for you no matter how much – or little – work you want to put into them. If you’re handy with a cutting mat, have a fully stocked ribbon carousel, and a glue gun trigger finger that’s itching to get to work, then use these from My Stampin’ Passion as inspiration. If that seems like too much for your busy schedule, there are tons of great, free or low-cost printable options that will be ready to go with just the click of a button! Who says magic has to be hard? Check out Etsy for some fun designs. 2) Unicorn Party Horns – Skip the boring old party hats for this magically upgraded version! Make them ahead of time so they are ready for when your guests arrive, or for a kid’s party, set it up as a fun and easy craft to get the party going. With just some paper, tape, glue, glitter and ribbons, you’ve got what you need to get the magic started! Follow this easy step-by-step or hit the glitter aisle at the craft store and go wild. 3) Gold Unicorn Bottle Openers – Unicorns aren’t just for the kids! Hand out these super trendy unicorn bottle openers as party favours and offer an array of rainbow coloured beverages to really get the party going. 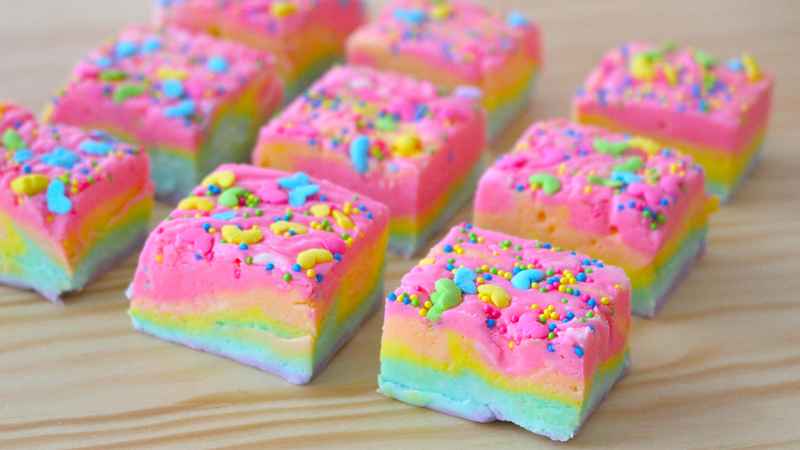 4) Rainbow Fudge – Every great party needs great food – and the unicorn magic doesn’t have to stop here. This is a pretty simple recipe and even easier with a step-by-step video to follow! 5) Unicorn Favour Boxes – Whether you pre-fill them with a some rainbow goodies, or use them at your candy table for guests to fill up as they please, these precious favour boxes have all the sparkle and charm in one tidy little package. 6) Unicorn Trinket Dish – Use them at your baby shower to hold candies or cookies, set strategically around the party space, or hand them out as a favour gifts to your guests. These trinket dishes are a unique and long lasting favour that your guests will use for years to store their jewellery, change, or as a candy dish. 7) Unicorn Piñata – Turn a boring old pony piñata into something way more fantastical with just a little bit of DIY know-how! Stick a gold foil horn onto that tired old horse and you’ve got yourself a hit! Here is a walk-through from Little Inspiration to help you along. 8) Delightful Unicorn Design Jewelry & Curio Box – Having a birthday party for your little one? Send the guests away with their very own unicorns by way of these precious little unicorn trinket boxes; all of the charm but none of the stable clean up. They are a perfect keepsake box for jewellery, charms, or any other little piece of magic that needs a special place. 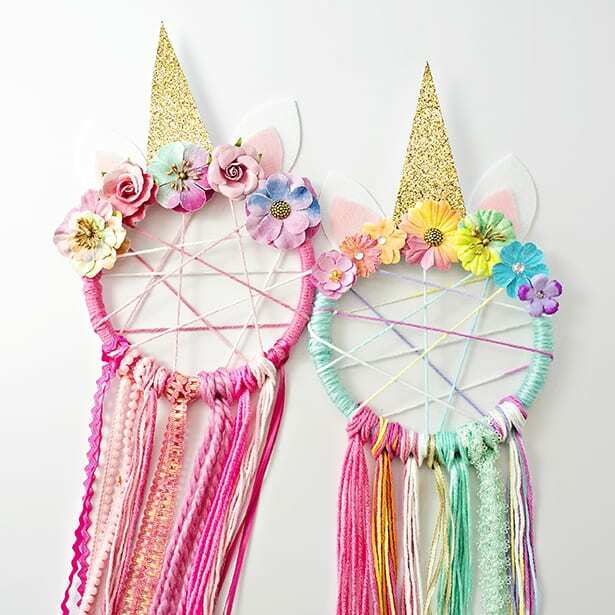 9) Craft Table Unicorn Dream Catchers – Unicorns are what dreams are made of after all, so this is a perfect project for a kids party. Fill the craft table with an embroidery hoop per child, lots of yarn and ribbon scraps to wrap the hoops and tie on for magical tails, an assortment of small fake flowers, felt or construction paper ears, and some gold glitter paper cut into triangles for the horns, and you’re all set! Check out this step-by-step for an easy guide. 10) The Cake – Of course, the centre-piece of every party, the cake! We absolutely adore the rosebud mane and the touch of metallic gold on the horn, ears and eyes. Set against the creamy white icing, the pastel flowers give a soft and dreamy look to this charming cake. Whether you’re just looking for some ideas, or you’re writing your party-planning checklist, these 10 tips should get you started in the right direction. Head on over to Weddingfavours.ca for even more magical unicorn party must-haves!